Tyler Perry proved it. Ice Cube, Kevin Hart, and even Dwayne “The Rock” Johnson have further confirmed the fact. With its lack of diversity and desire to play to a specific teen demo, Hollywood has become out of step with the needs of others in the audience, preaching to a specific crowd while almost completely ignoring the rest of the entertainment starved public. Universal gets it. Instead of viewing actors of color as a liability, they have embraced them in such successful franchises as The Fast and the Furious and earned big bank in the process. Girls Trip is destined to do the same. It’s a riotous, laugh out loud comedy which doesn’t shy away from its ethnic core while creating enough goodwill and hysteria to keep even the most milquetoast viewer rolling in the aisle. Led by a capable cast and directed by Malcolm D. Lee (The Best Man, Barbershop: The Next Cut) and doing its R-rated bests to push boundaries as it brings on the smiles, this is an incredibly endearing and clever comedy, a rarity in a genre awash in ad-libbed missteps and an over-reliance on improv. Not that there’s not some of that here, but the story sets itself up to allow the characters and their personalities to provide more punchlines than something made up on set. We begin in 1992, when the Flossy Posse are in college, learning how to party hard. But once they graduate and go their separate ways, the realities of being an adult start to sink in. 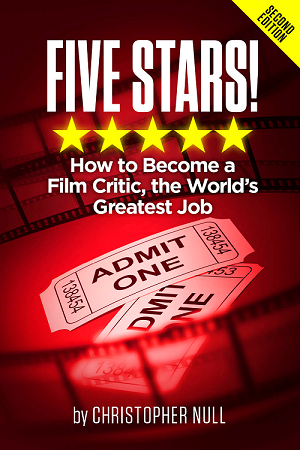 Ryan (Regina Hall) is a successful self-help author, while journalist Sasha (Queen Latifah) has gone from breaking stories to raking muck as a gossip columnist. Their freaky buddy Lisa (Jada Pinkett-Smith) has traded in her wild days for time as a nurse and divorced mom of two, while their man crazy pal Dina (Tiffany Haddish) is still the crazy comedian of the group. They decide to get back together for a long in the making reunion and end up in New Orleans for the Essence Music Festival. 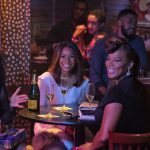 There is lots of drinking and debauchery, but the one thing that is the most striking about the ladies of Girls Trip is how good the chemistry is between them. If they aren’t BFFs in real life, they should be. They are so good at conveying the emotional bond between them that you’ll find it hard to believe that they don’t hang out in real life. With lots of funny cameos (including performance clips by Diddy and others) and a desire to go as far as they can while still keep the audience on their side, this is a solid, sensational entertainment. Don’t be confused, however. Girls Trip is about as far from the God-based comedy of Perry and his prayer group melodramas as Madea is from Mother Courage. There are discussions revolving around how to please a well endowed man that will leave your gasping for breath as you’re picking your jaw up off the floor. But the crudeness never feels forced. Instead, Lee does a great job (along with the screenplay by Kenya Barris and Tracy Oliver) of having it become a natural outcome of these gals’ adversity to what the kids today call “adulting.” When men do show up, they tend to wear the cliches that Perry’s old battleaxe warns women about over and over again, but our quartet are so warm and winning we don’t care. No, the overall script is not as tight as it could be (this is another two hour plus comedy) and there are moments where potential opportunities are avoided or misused, but for the vast majority of its running time, Girls Trip is one riotous moment of female release after another. It’s the Summer’s sunniest laugher and proof that, if you build it right, the audience will come — and enjoy themselves — in droves.